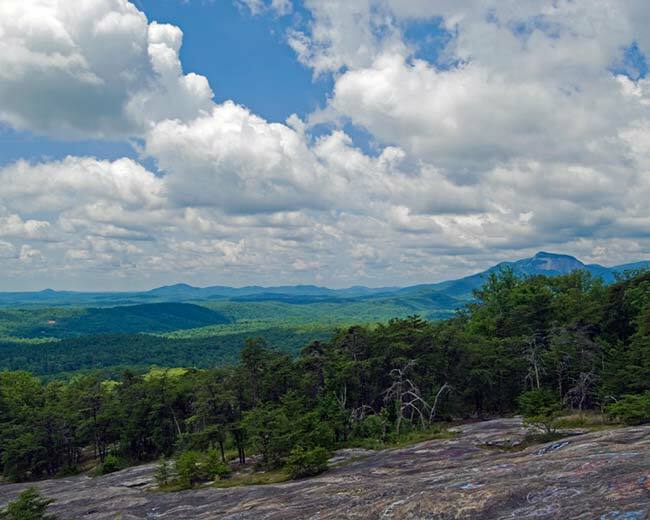 With spectacular Table Rock standing in the distance, Bald Rock Heritage Preserve provides one of the best panoramic views of the South Carolina foothills. 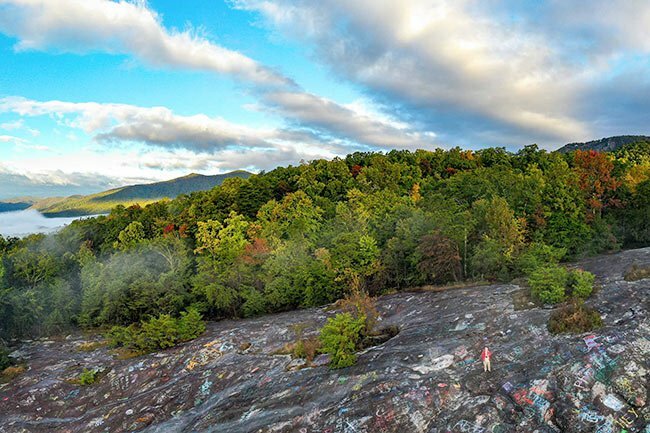 Adjoining Caesar’s Head State Park, the 165-acre preserve, including its eponymous rock face, is a popular stop for travelers winding through the scenic roads of Greenville and Pickens counties. 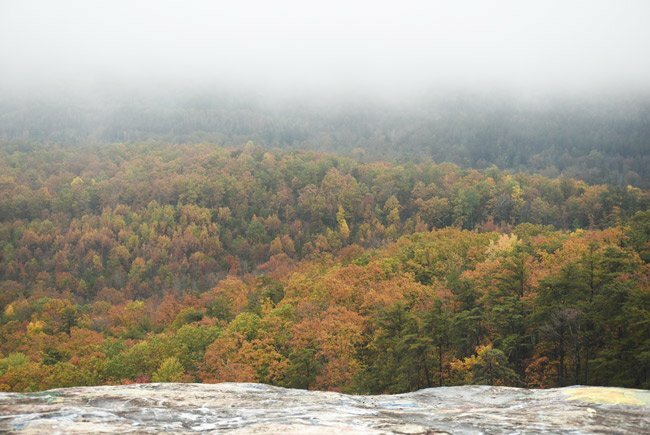 The preserve is part of the Mountain Bridge Wilderness Area, which includes both Caesar’s Head State Park and Jones Gap State Park as well as Wildcat Falls. Access to the preserve’s namesake rock is provided by a wooden footbridge. Managed by the South Carolina Department of Natural Resources, the preserve harbors two headwater streams that provide habitat to protected plant species such as Piedmont ragwort (Packera millefolia) and grass-of-parnassus (Parnassia glauca). Graffiti is noticeable on the rock. Sadly, some visitors believe that painting the rock is a harmless tradition. However, the paint causes harm both to the surrounding plants and the animals that eat them. 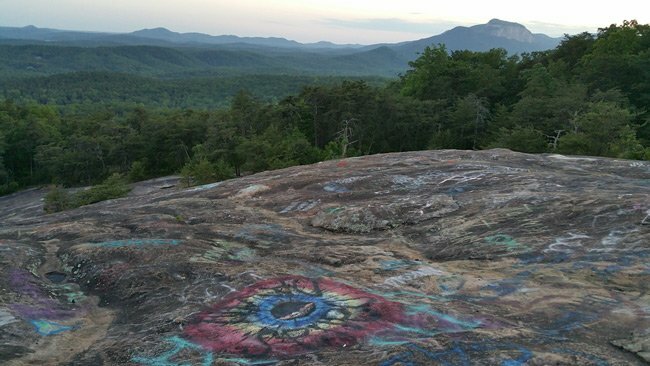 Defacing the rock and its grounds in any way is strictly prohibited. Visitors also are asked to pack up their trash when leaving the preserve. Taking such measures to protect the ecology of this breathtaking vista ensures that all can enjoy its natural beauty for years to come. 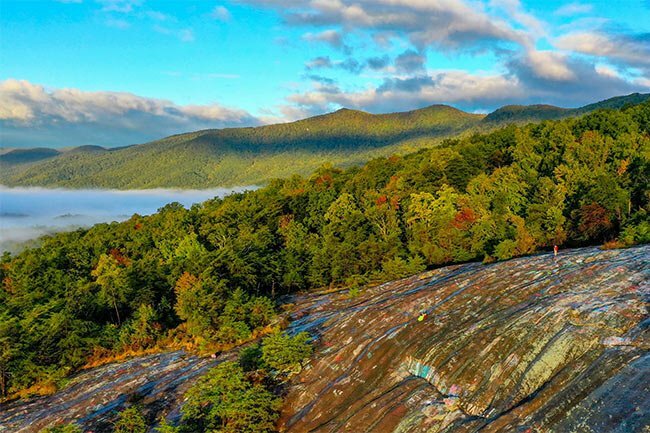 Even with the presence of graffiti, the mist and mountains of the South Carolina Foothills are an astounding view from atop this granite formation. It is essential for visitors to remember that runoff from rain can lead to spray paint infiltrating the aforementioned streams. 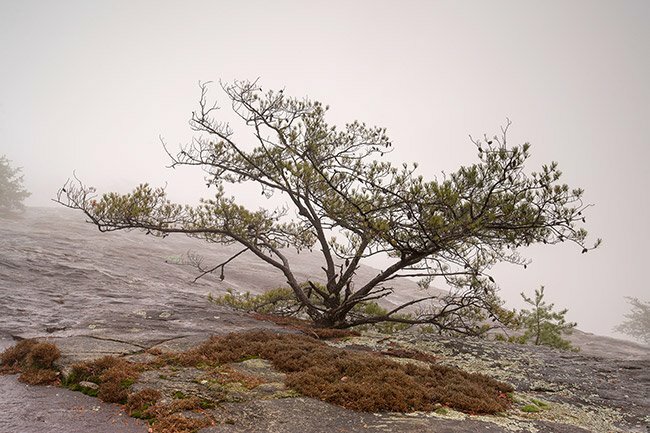 Please help keep Bald Rock Heritage Preserve’s habitat healthy. observe the launch of an Apollo launch from Florida. It had been reported previously that a local pilot flying south of Greenville had seen an earlier launch. I felt that being up over 3,000 freet on the bald rock I might be able to get a glimpse of the launch. I had played hookey from work that day and took my small 2.5 inch (60 MM) telescope to the mountain. When I arrived it was obscured by a thick fog. ;-(. By the way I went to work sad and disappointed. Who owned the land in the past. I keep hearing about Fortner Mountain . Could this be it. Did a Fortner once own the property ? 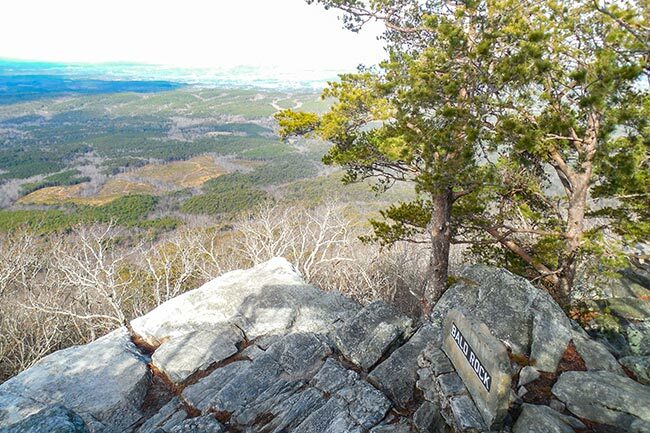 I’m curious if anyone has experienced any spirits or ghosts on bald rock. Yes it is (Table Rock mountain). Yes I do believe that’s Table Rock toward the right of all the pictures. I am curious as to the name of the bald face mountain you can see to the right, when standing on Bald Rock. Would this be Table Rock?? ?